Cubs is for boys and girls between 7 and 10 years old. We all know the adventures described in the Jungle Book! The characters are a young boy and jungle animals that children can relate to, led by Akela – the jungle book's leader of the wolf pack. Together, they embark on exciting adventures whilst learning new skills. 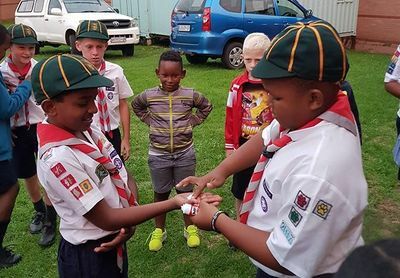 The Cub Advancement Programme provides the levels that a Cub works on at different stages of their Cub Trail, starting when they earn Membership and are invested as a Cub, and continuing as they earn their Silver Wolf, Gold Wolf and Leaping Wolf badges, and finally their Link Badge when they go up to Scouts. Along the way, there are plenty of Cub Interest Badges that a Cub can earn, on a wide range of fun topics. Are you a boy or girl between 7 and 11 years old? Interested in joining the fun and excitement of being a Cub, and being part of the world's largest youth movement? To learn new things, make new friends, help people, and protect nature around you... find out about becoming a Cub. You will be glad you decided to be a Cub. Like all children you enjoy playing games, having fun, and learning all sorts of interesting things. You have joined the right group. A great adventure is coming your way... Welcome to Cubs! What is Cubbing all about, and how can you support your child at Cubs? And the most popular question of all, where must I sew that new badge on my child's Cub uniform? We'll try to help answer your questions in this collection of information for Cub parents. Behind every successful Cub Pack are the adults who run it! This section is "Packed" full of ideas, meeting programmes and information to help you run exciting activities for your Cubs. Leaders can also contribute material, to share ideas with other leaders in the Pack Scouter Resources section.